The fourth installment in EN Publishing’s so far simply superb, investigation-driven steampunk-AP clocks in at 73 pages, 1 page front cover, 1 page editorial, 1 page ToC, 1 page SRD and 1 page back cover, leaving us with 68 pages of content, so let’s take a look! Still here? All right! The intrepid constables of the RHC, i.e. the player characters, find themselves on a reconnaissance mission in this module – they have uncovered the presence of a shadowy conspiracy, but so far know next to nothing about them. Having investigated Caius in Zeitgeist #3, the PC’s know he would have been boarding a train in Beaumont at one end of the Avery Coast Railroad and travel its length to the city of Vendrice. Spy Missions are no easy thing, and unlike many a shadowrun mission I’ve read throughout my DMing career, here we are not left in the dark: By starting the adventure with a planning phase and providing ample options for skill checks to e.g. create false paper trails, establish cover identities and make plans for contingencies. Even risky propositions such as attempting to buy off the spies on their trail, are not off the books and distinct options – though ones that already carry a solid possibility for failure. Better yet: If your players don’t like investigations/spywork (then why are you playing this AP, though? ), they can jump immediately into the operation, though at least in my opinion, the module looses quite a bit of its charm that way – especially since failures tend to not result in dead-ends, but rather detractions from the degree of the respective success of the PCs. On the way to Beaumont by ship, the PCs will have their first hostile encounter herein – if you want to go naval combat here, I’d suggest Frog God Games’ “Fire as She Bears” instead of the standard “Admiral o’ the High Seas”-rules the Zeitgeist AP presumes. Beyond that, enough information is provided for you to run this particular encounter as a more or less straightforward hackfest. Anyways, the PCs should thus have a good reminder that their meddling has made some important people rather giddy. Thus they enter the nation of Danor. Danor is problematic for especially casters – magic doesn’t work well within the wild/dead-magic-zone riddled nation, thus requiring some careful deliberation on behalf of the players regarding their casting prowess. So yes, the PCs will need to be smart when handling this assignment – after all their goal is not engagement with the enemy. hence, they board, among the vast bustle of people, the train – 1st class, of course! 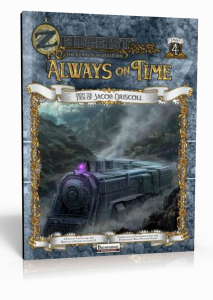 The train and its passenger are lavishly detailed and making appropriate observations and conclusion will be hard – even before a stop in Danor’s capital Cherage makes tracking the suspects (all of which have something going on the PCs can discover) rather interesting. On the next day, a passage through the wild lands (including a short safari-break) beckons – as doe new passengers. The city of Orithea, the next stop, will also see complications in the PC’s espionage-duties, with interactions between passengers, many a thing to do…and a constantly ticking timer. On the next day, the constables will have a chance to thwart a train heist in a swampy terrain, with aberrations and bandits – and thankfully a nice breakdown of locations, number of spawns and cars for the respective characters, making this encounter complex, but manageable for an experienced DM. Less than an hour after the attack by the gargantuan aberration, the PC’s adversaries are notified of them being spied upon, just as the train reaches the lands of Drakr. Discussing the nature of conflict (and world’s end), counter-espionage by the PC’s targets, unrelated black market/espionage deals – there is a lot going on beyond the main plot – so much, in fact, that all the characters come vividly to life and can or cannot have serious impact in the future, while remaining optional for the purposes of this investigation. Still, by the end of this part, the PCs ought to know who their primary suspect is, while at the same time having met some characters that will return in future installments of the AP. Here a massive spoiler is in order – part of the plan of teh Obscurati revolves around magical lanterns, which can draw targets throughout the planes. hence, the villain’s goal is to get the PCs in a given isolated locale and draw them into a hostile plane – In Nem, the spirit becomes the body – when no longer close to the approximation of their bodies, the PCs die. Usually, this would be no problem, but the train’s movement means that they are on a tight timer. Undead, the ghosts of the murdered – the PCs are stuck in the train’s ghost equivalent, fending off the deadly assailants and hopefully finding the lantern, destroying it before their spirits are whisked away. After this supernatural assault, the PCs ought to be VERY paranoid when they reach Sid Minos. In order to triumph here, though, the PCs will not only have to have drawn the right conclusions, they better also be up to their a-game – if they are, they may have actually gained some important allies. The appendix depicts in detail (and with maps) the train, provides further filler NPCs and general guidelines for investigation and the tailing of suspects are provided alongside a selection of 8 magic items (one of which is a new quality) as well as a quick-reference sheet of NPCs for the DM, a mission timeline and a nice advertisement-style handout for the scenic railroad route. Editing and formatting are very good, though not perfect – I noticed e.g. one instance of part of a DC’s number being obscured beneath a relic and I also encountered some very minor typos/wording glitches. Layout adheres to EN Publishing’s drop-dead-gorgeous 2-column full-color standard, with artworks ranging from superb full color to comic-style mugshots to thematically fitting b/w-stock art. The pdf comes fully bookmarked with nested bookmarks for your convenience and the pdf is layered, allowing you to customize the pdf for printing it out, all according to your needs. Zeitgeist modules are damn friggin’ complex beasts, but gloriously so – they involve a lot of moving parts, NPCs, contingencies and options for DM to get the module, proverbially, back on track. This is no exception and while the module is, quite literally, a railroad, it also is surprisingly player-driven with all the suspects, investigation guidelines, etc. allowing for a lot of outcomes, for a lot of different approaches, while always providing options for the DM to get things back on track. Sorry, I swear that was the final railway-pun. So is this a great module? Yes, yes, indeed – author JAcob Driscoll has delivered a complex, cool investigation against a unique backdrop, one that not as complex as CoC’s legendary Orient express-campaign, but one that fits seamlessly in with the overall AP. More so than in previous installments, though, DMs should take heed to impress the investigation-focus of teh whole AP: Players seeking primarily roll-playing will eb frustrated by this triumphantly brains-over-brawns module. My final verdict will clock in at 5 stars + seal of approval – I applaud the sheer guts of deviating from the mostly combat-driven gameplay of most modules towards a rewarding ROLEplaying experience seldom seen in any d20-based system. You can also get the 4th edition-version here on OBS! as you can see, I finally managed to get some reviews online. As some of you know, I’m currently experiencing, no hyperbole, the most stressful time of my life. Hence, all reviews you’ve been seeing on the site since about two months have been drafted prior to that time and just needed some minor re-reading. Now here’s the good news: First of all, I’m catching my breath and reading again. Also, there are quite a lot of BIG books and respective reviews waiting to be completed, so expect to see some long-awaited ones I’ve been asked multiple times about soon! Thank you for your continued support, nice words and downright awesomeness! I wouldn’t be doing this, were it not for you fine ladies and gentlemen out there! I know which author/publisher wants me to do product xyz rather soonish, and I will tackle those soon. But I don’t know what YOU, i.e. the people who actually visit this site and support it would like to see me tackle soon. So this question is mostly about supplements I haven’t read yet – what product are you on edge about until I review it? If you have already contacted me re a product, rest assured that I have already read it and that the review will hit the site relatively soon. Another question: I’ve been reviewing FATE and DICELESS products here and there, since I consider other systems just as interesting, but do you share that sentiment? This pdf is 26 pages long, 1 page front cover, 1 page editorial, leaving us with 24 pages, so let’s take a look! I LOVED Lords of Gossamer and Shadows – its imagery of this vast staircase with doors to infinite worlds resounding well with my tastes and sensibilities – here, then, we have an account of one well-versed in the intricacies of the Grand Stair, the rather powerful Warden Lucien, who guides us in a neatly written in-character prose through some of the weird and wonderful places of the Grand Stair. From the interplanar market place to the unstable (and lavishly rendered) rickety stairs and the starlit stair over to the labyrinth, Lucien provides accounts of his journeys and perils in prose so vivid, it’s a joy to read – and inspiring to boot! But this is no mere travel journal – interspersed are subjective theories on the nature of the stair, its at times maze-like qualities, warnings against migratory flocks of pants emerging from one of the weirder worlds, etiquette regarding how to pass one another sans provoking a fight and even Rhen-codes further paint a picture both titillating and strange. Who are the Rhen? Well, legend has it they were the nomads of the stairs, long vanished to a fate none can ascertain – only their graphic codes remain here and there, relics of an age long gone. 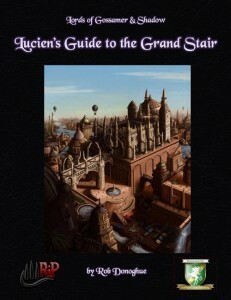 Lucien also has sound advice regarding ambushes (and their most likely goals) on the Grand Stair. How (and whether) and by what rules magic works on the Grand Stair is covered as well, with each cantrip coming with an incantation to actually say (AWESOME!) as well as Lucien’s notes on how to use them: 3 cantrips and 6 spells (one of which allows you to determine your subjective gravity), complete with lynchpins are provided for the traveler. We also get a new 5-point power with “Walker of the Grand Stair” and 6 new lesser abilities – these represent components of a greater power, partial understandings etc. General hunches on destinations etc. become distinct possibilities. The pdf also introduces so-called expanses – these are mostly constant areas of the Grand Stair that can be attuned to a warder to varying degrees – either for 1, 2 or 4 points. Here, the pdf could have been slightly more precise – it is not 100% clear whether one needs to take the 1-poin attunement before the 2-point awareness or not, i.e. I don’t know whether one can directly go for the 4 point cost or not. I *assume* not, but the pdf does not specify, so that’s a minor blunder. Cartas, the maps of the doors and the worlds they connect to, come also in 3 versions with point-costs, though, again, it is not 100% apparent if the point costs of them are cumulative or not, though here, I assume that’s not the case – otherwise you’d get 3 different cartas for the total of 7 points. We also are introduced to an annotated compilation of what Lucien considers the capabilities of teh Wardens of the Great Stair. We end this book with two sample wardens who come with their own glorious artworks (from LoGaS) – the eponymous Lucien and his bodyguard/second n command Gretchen. Editing and formatting are very good, I didn’t notice any significant glitches. Layout adheres to a full-color two-column standard with a purplish border . The pdf comes fully bookmarked for your convenience and the full color artworks, most original, one taken from the LoGaS-book, rank among the best you can find in any publication – yes, they’re that beautiful. Author Rob Donoghue has crafted one fine supplement that could have turned sour VERY easily – LoGaS’ appeal lies in its vast possibilities and a guide like this could easily have eliminated tantalizing possibilities in favor of “truths.” Instead of falling into that trap, this supplement explains truths, but relative ones, provides guidelines without prescribing things for DMs – this is the only way how such a supplement could have worked for a setting like LoGaS. Mr. Donoghue’s prose is vivid and clear and makes reading this supplement a joy, so that’s a significant bonus. On the downside, I’m slightly irked about the point-costs of cartas and expanses. While I think the intent is mostly clear, the fact remains that here the wording could simply have been more concise. This, alongside the none-too-cheap price point are my only, minor complaints – though they are significant enough for me to arrive at a final verdict of 4.5 stars, I don’t consider it enough to round down, thus rounding up. This installment of the Racial Ecology-series is 17 pages long, 1 page editorial/front cover, 1 page SRD, leaving us with 15 pages of content, so let’s take a look, shall we? Canids are, surprise, canine humanoids that usually, much like man’s best friend, accompany other races – their communities usually exist in a kind of symbiosis with specific other humanoid cultures. Hard racial-trait-wise, they get +2 to Str and Cha, -2 to Int, low-light vision, scent, a 1d4 bite attack as primary weapon (or secondary weapon when wielding arms), get +1 to Bluff, Diplomacy and Sense Motive with their associated race (I assume a racial bonus, but the pdf doesn’t say), +2 to perception and survival, can run on all 4s when carrying nothing in their hands. This would net a +10 foot bonus to movement for run, charge or withdraw actions. They can only do so while having medium load or less – and I assume they don’t get a quadruped’s usual bonus to encumbrance. To reflect their racial diversity, they can pick one alternate racial trait or a racial trait of 2RP or less and they do thankfully have some limitations applied to the selection. Still, I’m not 100% comfortable with this variety – why? Because the race is well-balanced on the upper echelon of the power-scale sans these and the ARG’s system is notoriously broken. On the alternate racial trait-front, we get to choose from 3 different ones – Bully build nest you the slow but steady racial trait and replaces the quadruped sprinting, whereas aforementioned diversity can be offset with a whopping +4 to CDM versus bull rush, trip, pull and drag. Finally, there are small canids that get, apart from their size-modifiers, +4 to stealth. We also get 5 race traits that allow you to run longer, drag something better (not the maneuver, the feat of strength), improved disguising, 1/day +2 to flanking and adaption to cold climates make for compelling race traits that manage to be useful without being overpowered and also offer a nice bit of fluff each – kudos for getting these right! On the favored class option-front, all of the Paizo-classes (minus variants like ninja/samurai, but including the gunslinger) are covered with sensible options. Oh, and thankfully we get FULL AGE, HEIGHT & WEIGHT-tables, 6 entries for various physiques – neato! Also cool – a short lore-table is included! We also get 6 new feats – improving bite attacks by one step and later, vicious bite allows you to chose to make your canid benefit from improved grapple when biting or gain the trip option. Finally, the third feat in the bite-chain allows you to inflict bleed damage or thrash bitten adversaries – the latter has a hick-up in the rules-vocabulary, when it allows you to either deal bonus damage or inflict the “shaken effect” – which should be “condition”. Also, the pdf fails to specify for how long the shaken condition lasts. Improved overland hustling is also a neat idea, as does the idea fit that canids may follow tracks at normal speed. The feat does have a hick-up, when it specifies that it allows them to follow tracks at twice their normal speed at -20 – one can already do that sans the feat. I assume, the penalty was supposed to decrease, but whatever the correct new number, it’s not in here. “Scent the Impossible” on the other hand is rather awesome – not only does it improve the option to track by scent, it allows the Canid to be particularly familiar with specific scents – these can then be picked up even in olfactory nightmares and overpopulated places – a great idea, also regarding storytelling. We also get 5 new mundane pieces of equipment – from dog whistles to muzzles, extra teeth, a weight harness and even a neck barrel. Among the two new magical items, we get a silence-inducing, damaging dog-whistle and a breath weapon granting hell hound tooth that may enhance a canid’s bite. Ratters get +2 Dex and Cha, -2 Int, +1 to CMD/CMB (+2 when surprised, flatfooted or prone) and while small, they still get a movement rate of 30 feet. Wardens get +2 Str and Wis, -2 Cha, +2 to resist fear and demoralize effects and aforementioned grounded racial trait. Hunters get +2 Str and Wis, -2 Int, Hunt on the Run as a bonus feat and +2 to perception related to smell/scent. Dwarven Bullys get +2 Str and Wis, -2 to Dex, must take the bully-build racial trait and replace low-light vision with darkvision. I assume the default 60 ft. range for darkvision, but the pdf does not specify. Elven Hounds get -2 to STr, +2 to Dex and Int get a flat-out ovement-rate of 40 feet (and don’t get faster when going on all 4s – which is weird) and +1 to reflex saves and initiative. Goblin Curs get +2 to Dex and Wis, -2 to Str, are small, cause allergic reactions in non-goblinoids and get +1 to atk and damage versus other canids and dogs. Gnomish ratters get +2 to Dex and Cha, – 2 to Int, are small and get hatred versus reptilian and goblinoid adversaries. Hafling Borzoi get +2 Dex and Wis, -2 Int, Hunt on the Run as a bonus feat, exchange scent for 40 foot movement rate and +4 to see through nonmagical disguises. Drow Demon Dogs get +2 Str and Cha, -2 Int, darkvision and replace their quadruped ability with a base-speed of 40 feet – again, somewhat weird that the offshoot is not faster on all fours. They also get +1 to intimidate and +2 to saves versus disease, though they do pay the relative power with losing more basic canid racial traits. Kobold Warren Dogs get +2 Con and Cha, -2 Str, are small and still have a movement rate of 30 ft and replace low-light vision with darkvision (again not specifying the range). Orc War Mastiffs get +2 Str and Wis, -2 Cha, replace low-light vision with darkvision (this time the 60 foot range is included) and they also get ferocity, but pay for that with losing access to racial diversity and light sensitivity. Painted dogs get +2 Str and Cha, -2 Int, hatred versus Gnolls and hyena-like creatures and +4 AC versus Gnolls. Finally, the small Xolo get +2 Dex and Wis, -2 Cha and these hairless dogs are under a constant endure elements spell-like ability (that does not specify an effective level and is not properly italicized) and may woodland stride in familiar jungles. Editing and formatting are okay – there are a couple of formatting glitches, which partially make the respective crunch slightly less clear than they ought to be. Layout adheres to a drop-dead-gorgeous 2-column full-color standard and the original pieces of full color artwork are simply awesome. This is one beautiful pdf. The pdf comes fully bookmarked for your convenience. The pdf lacks bookmarks, which is an unpleasant comfort-detriment. Author Nick Esposito has created an interesting race, slightly on the upper end of the power-scale, but not by much. 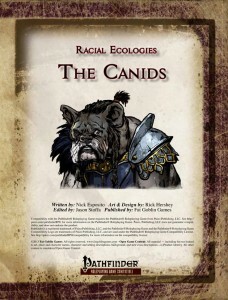 While the racial diversity utilizing the broken ARG can be potentially problematic, per se the variants feel well-balanced and diverse, if admittedly not all of them are brilliant – more weird breeds with unique abilities like the Xolo or the Goblin Cur’s allergies would have elevated this pdf further. Per se we get a solid race that has a lot, but in practice is haunted by quite an array of typos and minor glitches. The rules-language, while for the most part non-ambiguous, features several flubs like lacking durations for conditions, calling conditions effects etc. – nothing big per se, but they do accumulate over time to a point where they stand out and show that a tighter editing would have helped this pdf. Beyond that and the missing bookmarks, there is not much to complain about – as presented, this pdf’s Canids are definitely useable and per se a relatively nice, if not always inspired race. Hence, my final verdict will clock in at 3.5 stars, rounded down to 3 for the purpose of this platform. You can get this nice racial supplement here on OBS and here on d20pfsrd.com’s shop. This installment of the Village Backdrop-series is 10 pages long, 1 page front cover, 1 page advertisement, 1 page editorial/ToC, 1 page SRD and 1 page back cover, leaving us with 5 pages of content, so let’s take a look, shall we? So what is going on in Vulgruph’s Hollow? Well, first of all, the village, once prosperous, is dived along racial lines – from the ingenious dwarven founders and their descendants, not much hospitality has ever been extended towards the humans, gnomes and halflings that constitute minorities here – whether due to sheer gruffness or racist tendencies would be up to the DM to decide. Beyond that, though, the village has now, for about a year, been plagued by animal mutilations that have since escalated into downright disappearances of folk – tensions run high and in a climate of suspicion, the culprit(s) thrives. Nestled on a river, connected by bridges to both sides, Vulgruph’s Hollow may seem easy to defend, its nearby dwarven monument pittoresk even – against this backdrop of mistrust and tension, a pair of star-crossed lovers may serve as a Romeo and Juliet-style subplot, while moderately capable (semi-) retired adventures (like a half-orc arcane duelist bard 5 or a dwarven swashbuckler rogue 7) and a lot of good folk may be only inches away from shedding blood, while the vile culprit of the crimes moves unrecognized among the populace, truly a wolf in sheep’s clothing. (And upon reading this supplement, what I mean by this will be so much clearer to you…) Said culprit also comes with full stats, btw. Editing and formatting are top-notch, I didn’t notice any glitches. Layout adheres to RSP’s elegant 2-column full-color standard and the pdf comes fully bookmarked for your convenience and in two versions – one optimized for the printer and one optimized for screen-use. The cartography is superb and as always, player-friendly high-res versions of the maps can be downloaded on Raging Swan Press’ homepage. Alexander Augunas, known mostly for his mastery in crunch as evidenced by his superb improvement and conversion of Pact Magic to Pathfinder, here delivers a splendid little town, concisely depicted with peculiarities galore, problems to solve and essentially multiple adventure plots that almost write themselves, showcasing a distinct ability to actually also write excellent and captivating fluff. 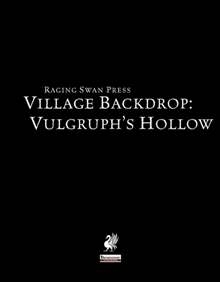 Vulgruph’s Hollow, more so even than many other Village Backdrops, has your work cut out for you and even though the basic tropes of the threats may have been covered already, the ease and level of detail with which the narratives flow together make this an excellent buy and a fun place for the PCs to visit – provided they can solve the issues. Otherwise, they may be stranded in a settlement imploding upon itself as paranoia escalates into bitter violence. Final verdict? 5 stars + seal of approval. You can get this awesome village here on OBS and here on d20pfsrd.com’s shop! As always with the Mythic Minis line, this pdf is 3 pages long – 1 page front cover, 1 page SRD and 1 page content, so let’s take a look at these new feats! -Ascendant Spell-like Ability: 3/day use a mythic version of your spell-like ability chosen upon taking the feat. Also expend 2 uses of mythic power for +1 use of the feat. Finally, spend 3 uses of mythic power to use the mythic version of another spell-like ability. Solid restrictions reign that one in. Two thumbs up. -Craft Construct: +MR/tier to skill checks pertaining the construction of constructs. Also construct mythic tier times 1K gold per day, making you much faster. Also includes concise rules to add the mythic simple template to the crafted construct for higher costs. Finally, this feat allows you to create sentient, intelligent constructs. Which would be awesome, but the pdf has a glitch here – these constructs get, according to the text, no less than 11d3 to charisma – which I *assume* probably should be 1d3. -Empower Spell-like Ability: If the spell-like ability chosen to be empowered can be used more than 3/day, you may use this feat an additional time per day per 2 mythic ranks or tiers after 1st. Also spend 2 uses of mythic power to regain a daily use of the feat. For 2 daily uses of the feat, empower a different spell-like ability, which may not exceed 1/2 level-2. Solid one, but not as cool as the ascendant feat. -Improved Spell Resistance: +1/2 mythic tier to SR versus mythic spells and SLs; Add full tier to SR vs. non-mythic spells and SLs. Okay. –Maximize Spell-like Ability: If the spell-like ability chosen to be empowered can be used more than 3/day, you may use this feat an additional time per day per 3 mythic ranks or tiers after 1st. Also spend 2 uses of mythic power to regain a daily use of the feat. For 2 daily uses of the feat, maximize a different spell-like ability, which may not exceed 1/2 level-3. Solid one, but not as cool as the ascendant feat. -Quicken Spell-like Ability: If the spell-like ability chosen to be maximized can be used more than 3/day, you may use this feat an additional time per day per 4 mythic ranks or tiers after 1st. Also spend 2 uses of mythic power to regain a daily use of the feat. For 2 daily uses of the feat, quicken a different spell-like ability, which may not exceed 1/2 level-4. Solid one, but not as cool as the ascendant feat. Maximized, Quicken and Empowered Spell-like ability feats can ONLY be used to enhance SLs that can be used at least 2/day. Editing and formatting are good, but not perfect. Layout adheres to a 2-column full-color standard and the pdf doesn’t have bookmarks, but needs none at this length. 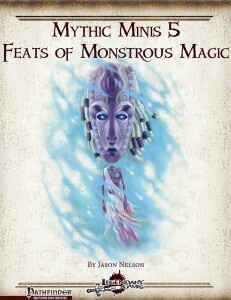 Jason Nelson delivers a selection of solid mythic feats herein that can work well to enhance your options for beasts by adding mythic versions of many metamagic tricks – which is nice to have. The options to empower, maximize and quicken are cool, if a bit linear in their solid craft. The construct creation and ascendant spell-like ability-feats are downright awesome in my book and well worth the low price of admission. Still, they are the 2 feats that really breathe awesome and show that the rest of the content is good, but simply not that inspired. Good, yes, but not that awesome. In the end, that makes me settle on a final verdict of 4 stars. You can get this solid supplement here on OBS and here on d20pfsrd.com’s shop. -Analytical Eye: When a creature has attacked you, spend one use of mythic power as an immediate action to learn about int-mod combat feats your foes may have. That’s…exceedingly boring, lame and unworthy of a mythic ability. 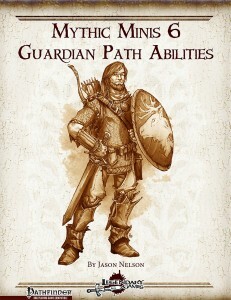 It is also recycled from the Champion mythic mini-pdf. Reprint at that brevity? -Flanking Foil: Get 1/2 mythic tier as dodge-bonus to AC whenever you are flanked. If a creature flanking you misses you, you get this bonus to atk on your next attack against it. So…does this mean an ally could theoretically threaten you, putting you into a kind of flanked position so you get the bonuses? If no, why not? After all, if the ally had been charmed an attacked you, but was commanded to miss, you’d get it. Being flanked usually is a passive condition you incur due to being outmaneuvered. Assigning active benefits to it is very problematic. Want a more drastic example? Take a bag of declawed kittens, handle animal them to attack the back of the heavily armed guardian – et voilà: Permanent protection from the detrimental aspects of flanking (apart from sneak attack). At mythic tier 4, the ability offsets the flanking bonus and nets you a +2 to atk as long as you have your rabid, impotent mewling bag of kittens ready. Partial failure of the kitten-test. Oh, and bad nomenclature – there is already a feat of that name, one that btw. is working better than this ability. -Terrible Courage: Get mythic tier as bonus to saves versus fear-effects and as bonus to the DCs to intimidate you. Also, essentially get evasion to fear-effects, ignoring partial effects, but also allowing you to cut the duration of effects in half, even if you fail your save. If you successfully save against a fear-effect, spend 1 use of mythic power to affect the originator of the fear-effect with its own effect, ignoring the potential immunity of non-mythic adversaries. Okay, I guess,. –Mythic Rider: Use mythic power to prevent being dismounted or having your mount fall prone. Alternatively, grant your mount hard to kill, recuperation and mythic saves for 24 hours. Solid for mounted characters. Also: Recycled from the Champion-pdf. –Parting Shot: When killed or reduced to being helpless, unconscious etc., make one AoO for every 3 mythic tiers you have, but not more than 1 per foe. Alternatively, make a ranged attack against a foe within 30 feet if you don’t threaten any foes. Spend one use of mythic power to ignore concealment with these attacks. This happens as you go down, i.e. you still take the damage/are killed etc. Cool concept, but has its issues: Does the usual limit of AoOs still apply? I.e. only one AoO sans combat reflexes? If the user has combat reflexes, do these AoOs have to be taken from the AoOs provided by Combat reflexes or are they extra AoOs? Also, when using the ranged option and an opponent with reach can make an AoO against you, does it provoke an AoO as per “ranged weapon in melee”? If using a melee weapon as a thrown weapon, do the improvised weapon modifications to atk and damage apply? In this case, is an AoO potentially provoked? This becomes relevant if the guardian is only rendered unconscious, not killed, so yeah – clarification once again required. -Shielded Perimeter: As a full round action, move up to your speed – all allies whose spaces you move through get 1/2 of your mythic tier to AC and to the acrobatics-DC to move through the squares. The bonus is further increased if you wield a shield- If you spend 1 point of mythic power, you also add the bonus to ref-saves and CMD of allies and makes the respective fields difficult terrain for your enemies. See, this one is AWESOME. Two thumbs up – that’s what Legendary Games ought to be about. –That Trick Doesn’t Work on Me Anymore: After analyzing foes with analytical eye, up to 1/2 of your mythic tier combat feats of your adversary can be selected. by spending 1 use of mythic power per feat you’ve chosen, you become immune to its effects, essentially cancelling out the benefits (but not the penalties) of the combat feats of the target when used against the guardian for 24 hours. And yes, this means potentially suddenly incurring AoOs – if the target is thus surprised, you get + mythic tier to atk with your AoO. Solid, though I don’t particularly care for the metagamey aspect and analytical eye. -Trick Rider: Another reprint from the champion – still a very boring ability. –Healing Sink: Maximize all healing applied to you, even supernatural and extraordinary healing. Also, when adjacent to a creature that gets excessive healing via conjuration (healing) beyond its hp, you receive that left over amount. Smart -since the caveat precludes infinite healing via regenerating troll-kittens. No complaints. -To the Last Breath: Immunity to being staggered, sickened or pain effects at or below 0 hp and do not lose hit points in this range. Essentially “To the Death”‘s big brother. Okay, though at this level probably not THAT relevant anymore – at 6th tier, Guardians will probably all-out die rather than being knocked unconscious. Still, an okay ability. At first glance, I thought “Yay, more content” – only to realize that that would be reprints from another mythic mini. This overlap is slightly unfortunate, seeing the pdf isn’t long in the first place, but all right. Where I was rather surprised is that some of these abilities have mechanical issues, which is pretty uncommon for Legendary Games. Worse, while some are truly iconic and cool, like “Shielded Perimeter”, the majority just didn’t blow me away – either due to minor ambiguities or due to simply being not that awesome – at 6th tier, for example, To the Last Breath would require a massive bonus to the negative HP-threshold before death to make ANY character contemplate taking it – otherwise it is mostly worthless, which is a damn pity. Overall, a rather weak installment of mythic minis with some issues that weigh heavily at this length. My final verdict will hence clock in at 2 stars. We all know the deal – sometimes players have to leave and sometimes, new ones join the fray. In my case, this means they have reading to do – A LOT of it. I’m not just using Paizo’s material, as you all know, but copious amounts of 3pp-stuff as well. So this irregular series will be devoted to spotlighting products that are required reading in my book. This first entry will deal with the “basics”, i.e. what *I* require my players to know beyond Core, APG, UM and UC. These books are central components of my campaigns and I’ll just drop a bullet-point style line for each and the links to get them. Usually, you ought to be able to find reviews for them by yours truly as well. Why it’s essential: It makes the much maligned rogue class completely modular and awesome in all the ways we never had since the inception of d20 as a system; the class becomes actually as awesome as it deserves. Hands down the best rogue for any d20-based iteration and it supports cherry-picking of rules as well! Why it’s essential: Better Stealth rules, much needed power-up for rogue, in-game explanation how they detect magic traps. Why it’s essential: One of the best crunch books ever made, psioncis feature just as heavily as magic in my campaigns. You ought to know what about half the foes you meet can be up to. Why it’s essential: My campaigns tend to have a darker tone than most and the occult feeling of Pact Magic perfectly complements this. Much like psionics, players should have read this to not be utterly stupefied by the opposition. And yes, it’s that integral a component of my game. Why it’s essential: Because it makes Pact Magic so much cooler, versatile and offers superb new content. Better in almost every way than Vol.1. Why it’s essential: Because my campaigns feature a lot of investigations/infiltrations/intrigue. More skill uses like autopsies etc. enable the DM to craft more complex plots – everyone wins. Players need to know this one so they can properly react to the challenges I throw at them. You’ll scarcely find a better resource for crafting more versatile plots and expanding the options of your players. Why it’s essential: Because this massive book and its three unique, awesome non-vancian magic systems are what the Tome of Magic wished it had been; Fun, balanced and awesome, the systems herein have become permanent fixtures in my home-game, beloved by players and my humble self alike. Complex, awesome traditions that reward system-mastery, tinkering and add awesome fluff to boot – yeah, pretty much brilliant. Why it’s essential: Because I hate that killing magical creatures yields no rules-benefits; because, in my worlds, magic items require exotic ingredients. Because questing to kill a foe for a component that is required for magic or an item is awesome. Oh, and it’s ridiculously beautiful. Get it. Why it’s essential: Because this massive tome eliminates vancian casting in favor of a more balanced, less exponential system. Beyond superb balancing, the mastery of crunch is pronounced and this huge book simply allows you to tell different stories – so, as far as I’m concerned, each campaign should consider whether this does not suit its needs better. Oh, and it plays well with psionics, pact magic, akashic mysteries… Yes, this is awesome! So that would be the absolute basics – next time I’ll tell you about the slightly less, but still very much required, more specialized books I tend to require for my players, i.e. the advanced basics. What are your books? Are there any you ABSOLUTELY require for your ALL of your campaigns that you ALSO require your players to know? If so, what are they? Drop me a comment, if you have the time! This supplement is 21 pages long, 1 page front cover and combined editorial/SRD, though on different pages, constitute together about 1 page, so we actually get approximately 19 pages of content – quite a bunch, so let’s take a look! Elemental lords? Yes – these powerful beings tend to get the short end of the stick when compared to archdevils, gods etc. 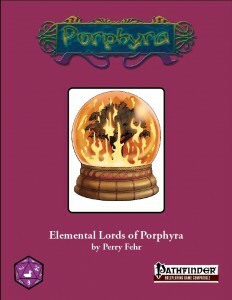 – and in Porphyra, they are exceedingly important. You see, the patchwork planet was once the domain of the elemental lords before the arrival of the gods from throughout the planes and the resulting NewGod wars. Somewhat analogue to the legendary Scarred Lands (though more extreme in several cases), the elemental lords thus represent the olden beliefs and still have a lot of worshippers that aren’t necessarily on good terms with the extensive pantheon of this planet. Whether they are gone for good or resurgent, though…only time will tell. We are introduced to no less than 12 elemental lords herein and I honestly expected rehashes of tried and true tropes. Let’s make that clear from the get-go: I was wrong. We get write-ups for domains/subdomains, favored weapons/animals, unique spell preparation rituals and 2 religion traits per lord/lady. But let me give you an example: Ashamar Shining, the Lady of Aish, the Glass Queen, cruel and beautiful as a searing ember’s flow cherishes the fragility of beauty, while her scorn and malice cut as deep as the splinters that are part and result of her beauty. As patron of glass-workers, her divine assassins kill with poisoned glass. It should also be mentioned that the religion traits provided represent maxims of the teaching of the respective lord/lady, adding yet another dimension to the vivid prose of the supplement. From the Ice Tyrant to the master of vines and grapes, the elemental lords make for harsh masters and mistresses and generally, they surprisingly uniformly transcend the lame old clichés – take for example Kurofu, the Shadow, master of Oni, samsaran and tengu – Dark wings, dark words indeed. Najim, the hidden god, born from the dark tapestry, sought to crash his body/moon into the world, now lying hidden beneath Purple Duck Games’ super-dungeon-series Purple Mountain, allowing us a glimpse of the possible things to come and offering yet another highly uncommon take on what one would expect from an elemental lord. Have I mentioned Poison Wave? The empress of naga? We also are introduced to 3 new subdomains with the oni, naga and retaliation subdomains. While the wording of these could be slightly more precise, the respective abilities are concise enough to prevent misunderstandings. We also get 12 new magic items, one allowing you to positively influence targets as if via diplomacy (sans save…). Another would be the ashglobe – a combined holy symbol with a SL and a means of adding a metamagic effect to a specific spell. Rather nice. Finally, we get 12 new spells that are exclusive for the respective lords and ladies. levitating massive amounts of weight (flying castles! ), ice-only minor earthquakes, detecting gems – the spells are mostly okay regarding their wording, if not always perfect. They work best when taking iconic concepts like creating a flying carpet made of FIRE or amplifying penalizing properties of light exposure in a small area. Editing and formatting aren’t in any way bad, but the wordings, especially in the crunchy sections could use a tad bit more precision. While not falling into the bad category, some refinement in this area could have made this pdf shine even more. Layout adheres to a beautiful two-column full-color standard with awesome holy symbol-style artworks for all the symbols of the lords and ladies. The pdf comes fully bookmarked for your convenience. Perry Fehr is one of the authors I never know what to expect of – he has written some of the best modules I’ve read, some cool crunchy pdfs…and some not so great ones. In part, one of his tendencies seems to be to allow for ambiguities in crunch – a tendency that, while not completely absent, is by far not that pronounced here. Perry Fehr is also a gifted weaver of words and his strengths come triumphantly to the fore herein – imaginative and unique, the elemental lords herein are thoroughly compelling beings, with intriguing backgrounds and awesome tenets – the write-ups of these beings, which constitutes the majority of this book, is completely and utterly AWESOME. To the point, where I actually want to know more about churches, planet, cosmology… and that, ladies and gentlemen, is the hallmark of great prose. While the supplemental rules aren’t necessarily flawed, they could have used some polish, though that should not deter you from taking a look here. If elemental lords with PERSONALITY beyond “I am fire guy” interest you, then this ought to be a must-purchase recommendation due to the ridiculously low, fair price-point. My final verdict will hence clock in at 4.5 stars, rounded up to 5 UNLESS you get this primarily for the crunch; Then round down instead, though I think the truly inspired fluff will adequately spark your imagination. 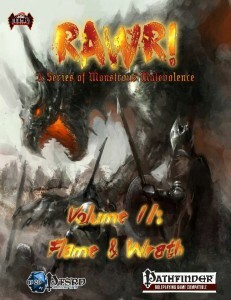 Worship the elemental lords and delve into their dark lore here on OBS and here on d20pfsrd.com’s shop!